If you loved (or hated) MasterCard skating to the rescue of Toronto’s outdoor rinks this winter, you’ll love (or hate) one of the city’s other sponsorship innovations: traffic signals. Yes, Toronto allows—encourages—corporations to pay for the installation of audible pedestrian signals (APS) at the intersections of their choice. In return, companies receive free advertising space at each location declaring their largesse and the city’s poverty. 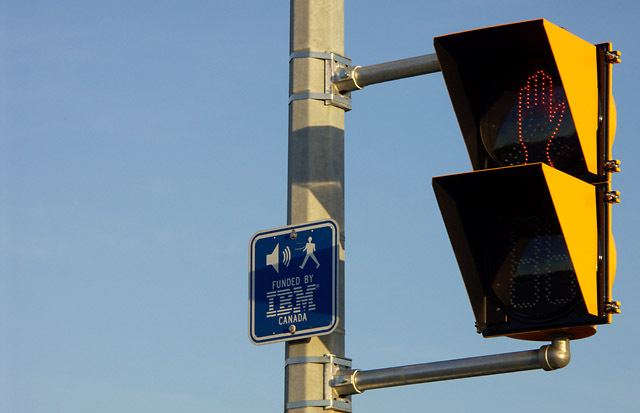 IBM had a blind employee who worked at the IBM facility near the Steeles Ave/Pharmacy Ave intersection and needed assistance to cross the intersection. IBM did not wish to wait until the intersection came to the top of the City’s installation priority list so IBM agreed to provide funding to allow this location to proceed immediately without impacting the existing priorities of other locations that were publicly funded. draw the attention of other large employers/corporate sponsors that they could assist their employees and contribute to civic improvement in this manner. There are several problems with this logic. Sponsored intersections may not get undue priority for public funding, but they do get undue priority. Presumably, the city’s list of intersections slated for APS installations is prioritized roughly by need and demand. If IBM or some other sponsor bumps an intersection up the list by paying for the installation, it effectively bypasses the city’s decision-making processes and imposes its own. If corporations are willing to spend money to “contribute to civic improvement,” why not just raise that money through taxation? It would give the city the freedom to decide exactly which parts of the civic realm require improvement, rather than relying on private donors to make those choices. The intersections where we’ve noticed these sponsored signals—including Don Mills Road at both Eglinton and Lawrence Avenue, and Pharmacy and Steeles Avenue—have relatively low pedestrian traffic, suggesting that they may have been low-priority APS locations for a reason. Would the city have been better served if the money for these sponsored APS installations went to pay for implementing the TTC‘s automated subway station and bus stop announcements instead? We certainly don’t pretend to know the answer. But the crux of the matter is that with the money coming from a private donor and attached only to a specific project specified by the donor, the city is unable to make that determination. It’s not a matter of evaluating the merit of one project against the other; someone else already made the decision. It looks like we can add one more thing to the list of basic services and infrastructure that the city no longer feels it can afford to provide. Filed under Don Mills Road, Lawrence Avenue, public service, advertising, Don Mills, Lawrence, news, politics, subway, taxes, the city, Toronto, TTC, Vandals!